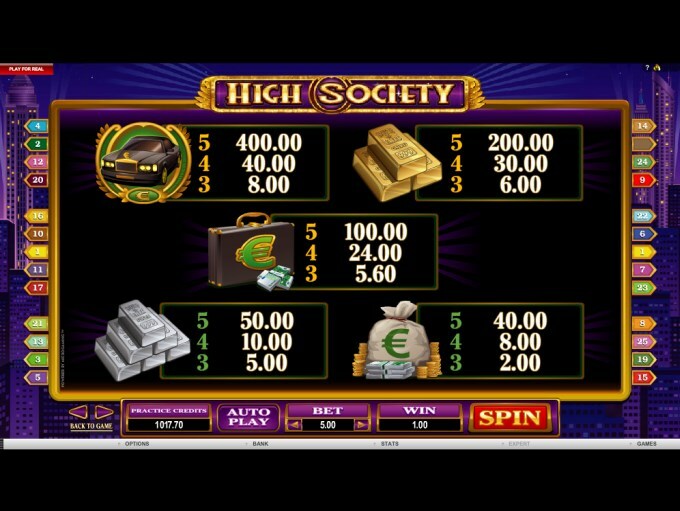 High Society is your not so basic luxury themed slot machine, one of the many to choose such a topic. Though the name is related to high society, the symbols all scream wealth, not class. You have yachts, you have suitcases with money in them, money bags and gold watches, diamond rings and bars of gold, all things that rich people would own. Microgaming created a beautiful looking slot in this case, above average even for luxury themed titles, though there are some great looking ones out there. If you want a shot at the $6,000 that is offered as the slot’s jackpot, you have to bet on up to 25 lines, all of them available in a 5 reel game. 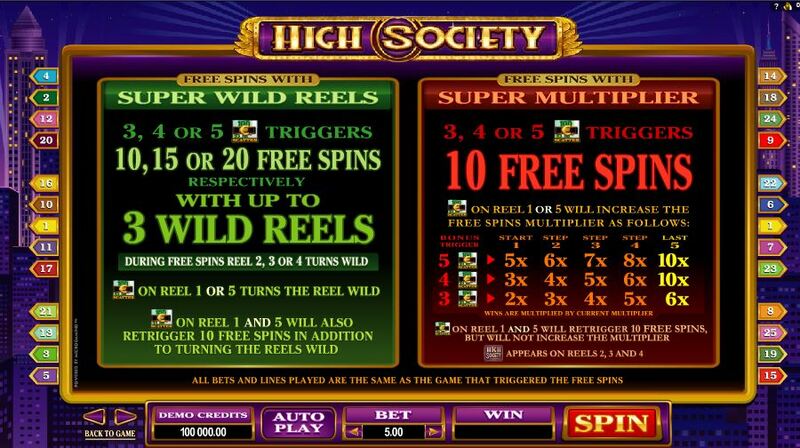 The free spins are the ones that stand out from among the features, with their two possible extras, the super wild reels or the super multiplier, but the wilds and scatter symbols have their own important roles inside. 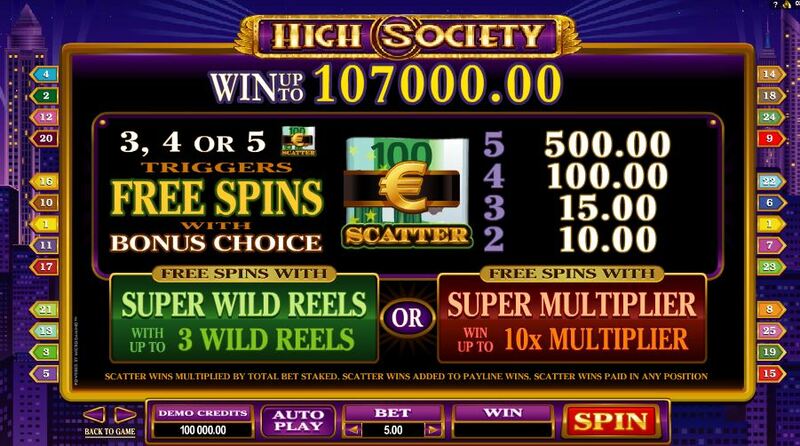 The game makes use of wild symbols, but the real focus is on the scatter symbol and the free spins it can bring you, especially since they have very interesting features, like the super wild reels or super multipliers. 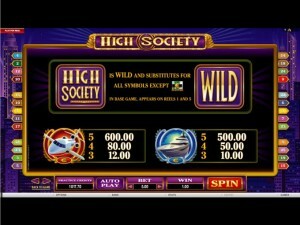 A High Society Logo is used as the wild of the game, a symbol that is only allowed to appear on the 1st and 5th reels. It will take the place of any regular symbol, the scatter being the exception. It’s not a symbol that can give away prizes directly. The scatter symbol is another important part of the game, perhaps the most important one. Showing an image of cash kept in a money clip, the scatter symbol will give you up to 100x the bet in prizes, when you have up to five of them on the reels. You get paid by as little as two scatters, but the bigger prizes are for the situations when you have more of them. The free spins are triggered by the same scatter, the requirement being that 3+ symbols are present in random locations in the game. Besides the free spins, you also get a choice of a bonus, so you pick either the super multiplier or the super wild reels to help you out along the way. 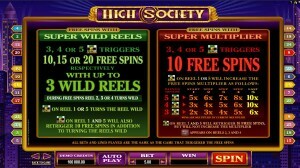 Super Wild Reels is one of the two types of features that you pick from, when enough scatters are present and the bonus is triggered. Depending on the number of scatters, the free spins vary here, so you get between 10 and 20 rounds for free. 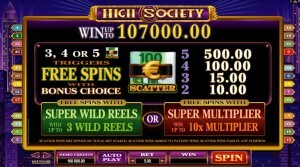 You also get up to 3 wild reels for the duration of the free spins. The reels that can turn wild are the three in the middle, but you only get one of them. Getting a scatter symbol on the 1st or 5th reel will turn it into a wild as well, so that’s how you can get to three wild reels total. 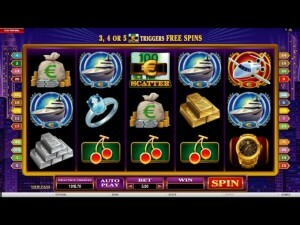 If you get that scatter symbol on both the 1st and 5th reels, you also receive 10 additional free spins from it. Super Multiplier is the name of the second possible feature that gets triggered. Here, you only have 10 spins for free, no matter how many scatter symbols there are. However, the number of scatters will influence the multiplier of the free games, which will be between 2x and 5x when you’re getting started. Each additional scatter symbol that appears during the free games will increase the multiplier, if it shows up on the 1st or the 5th reel. Up to 10x multipliers are possible this way. Also, with the scatter on both the 1st and the 5th reel at the same time, you get an additional 10 spins for free. You can spend up to $2 per line, or up to $50 total. The line bet uses as many as 20 coins, despite only going up to $2, so the denomination of a coin is up to $0.10. You will get up to 3,000 times the line bet back, if the top jackpot is won. That’s up to 60,000 coins, or $6,000. There are huge multipliers in the free spins, of up to 10x, so you definitely can take home more than that. The design is luxurious, and the multitude of gold plated or expensive objects make sure of that, but it also has a certain city vibe to it, the background picture being to blame for that part. It’s the story of a billionaire living in Manhattan, in a penthouse and with plenty of skyscrapers visible behind the reels, not of someone that’s staying in a mansion in the Hamptons. The quality of the design is a good one, good enough to make it one of the top choices when it comes to luxury themed slots. Symbols: High Society Logo (wild), Cash in Money Clip (scatter, 100x the total bet), Private Jet (3,000x), Yacht (2,500x), Limo (2,000x), Gold Bars (1,000x), Money Briefcase (500x), Silver Bars (250x), Money Bag (200x), Diamond Ring (200x), Gold Watch (150x) and Cherry (150x). I’ve enjoyed it quite a bit, the luxurious feeling being present inside as you play it, with lots of high quality symbols showing you money in different forms and other symbols of status and power. The only thing I’m unhappy about is the total value of the jackpot, as I expect much bigger payouts from luxury themed slots. 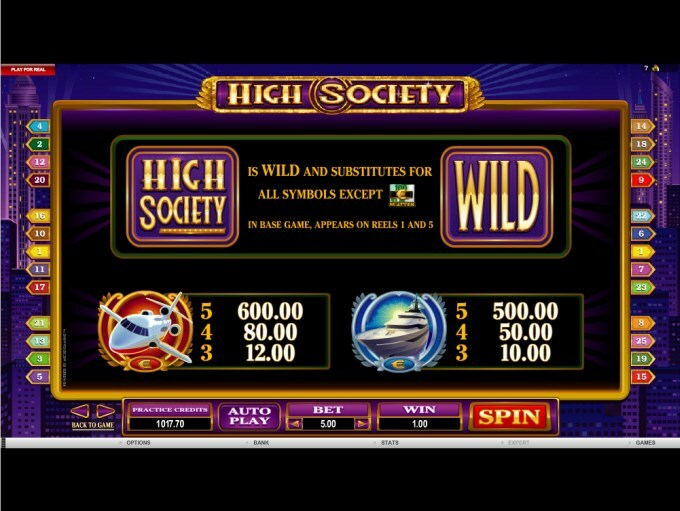 This High Society slot is offered by all online casinos with Microgaming software, playable either in practice or in real money mode.